Localized to one degree or another for English, Spanish, German, French, Italian, Korean, Portuguese, Russian, simplified Chinese, and traditional Chinese. Translations generously provided by your fellow overachievers using the CurseForge localization system. If you see a "Donate" link above, please use it. If not, you may try this link. 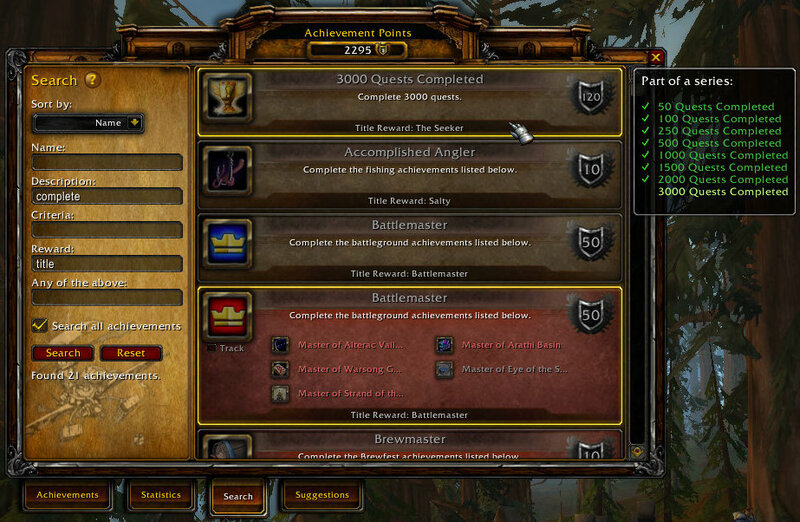 About the lengthy project name: "Overachiever" was not showing up on curse.com addon searches for "achievement"; the name change fixes that. I want to filter achievements to see only the ones that I'm tracking. Possible with this addon? You can use the Watch tab to set up a list of achievements. You can have multiple different lists with whatever names you like. Clicking on event name in Russian Client doesn't show up achievements related to that event. Instead it types event name into "location" and doesn't work. Can you be more specific? Do you mean the popups telling you about the day's holidays? It might be that the translations aren't correct. Look for the HOLIDAY_* keys in Curse Forge's localization system. They need to exactly match the values used by the in-game calendar in order to work properly. The map tooltips on the map are not showing up. Is this a normal behaviour or do i need to flick a switch somewhere for stuff to show? I'm not sure which tooltips you're talking about. Overachiever doesn't add anything to the map. Is something broken that's normally there without addons? Is there any way to make the addon show stuff on the world map, E.G. Or have i been using the wrong addon all along? Is there was an option of recently spotted achievement alert? I use "suggested achievements" all the time, and sometimes I miss some some "spotted achievements" around me, critters, fishing etc. Then i go back to the area and search for it. I wonder if there could be some kind of onscreen alert for this? Just a thought. There is an option to play a sound effect as an alert for many of these. There isn't a visual alert, though, other than what's added to tooltips. If those aren't enough for you, feel free to suggest this feature using the Issues page. "Cow" does not show "needs /love" on the tooltip when it is needed in Elwynn Forest for Achievement. Nor does "Deer" in Elwynn. ok and the "Sheep" so I guess we are still a work in progress. This used to work. It seems that Blizzard changed something; I don't know how long ago. This will be fixed in an upcoming version. Somekind of way to track achieves that come from BfA mission tables. Tooltip for example? Overachiever doesn't add any such button. 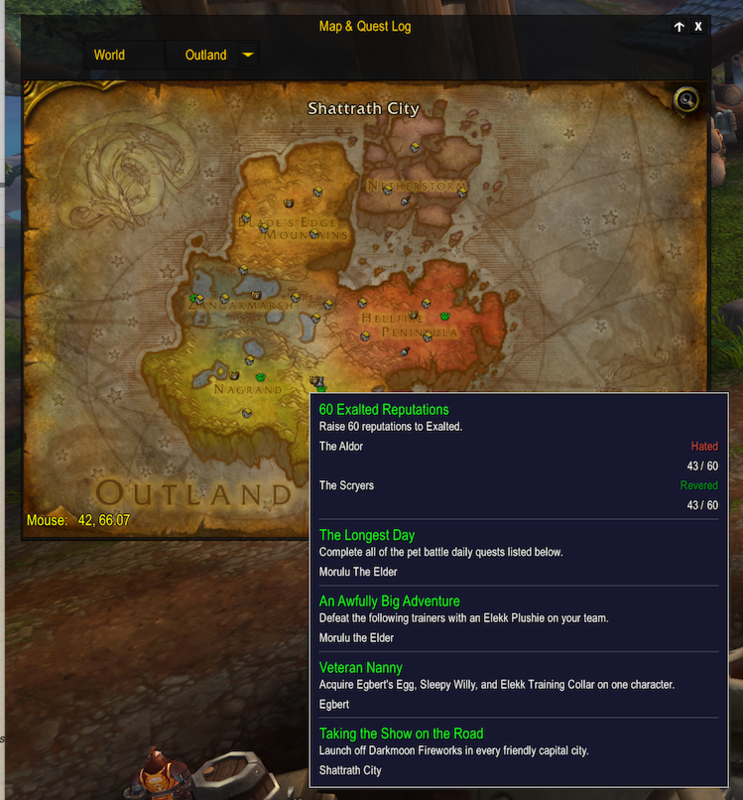 Display icons next to recipes you need to cook for "The Northrend Gourmet" and "The Outland Gourmet." Ctrl+click on one of these recipes to open the UI to the achievement that requires it. In most recipes i can see the tooltip saying "need to consume or cook" but with those,Northrend and Outland, i cant... i guess i am doing something wrong, but i dont understand what could it be. Thanks for the report. This is fixed in the next release. You can download the alpha if you don't want to wait for the final version.